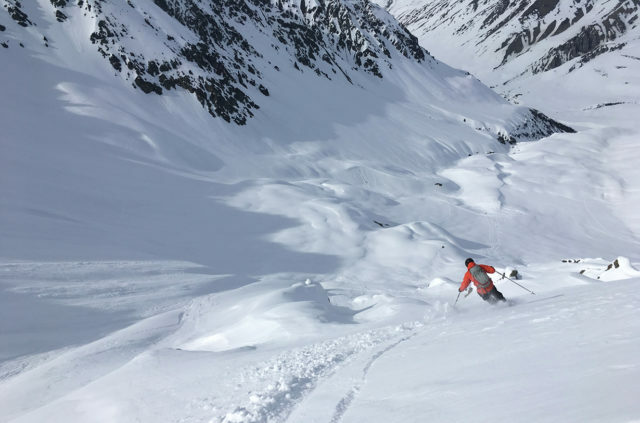 The Scarpa Alien RS was new for the 17/18 season, and it just might represent a significant step forward in the performance-to-weight ratio of lightweight ski touring boots. We’ve been consistently impressed by the skiing performance of boots like the Dynafit TLT5, 6, and 7; Atomic Backland Carbon, Arc’teryx Procline Carbon Support, Salomon X-Alp S-Lab, and the Scarpa F1 Evo, and it appears that Scarpa has set their sights on creating a boot that offers similar performance to these boots, but at a significant weight savings. Paul Forward in the Scarpa Alien RS, South-central Alaska. With that description and a stated flex rating of 95, it appears that Scarpa is attempting to offer the performance we’ve come to appreciate in this class of boot but with a 100 – 300 g weight savings. 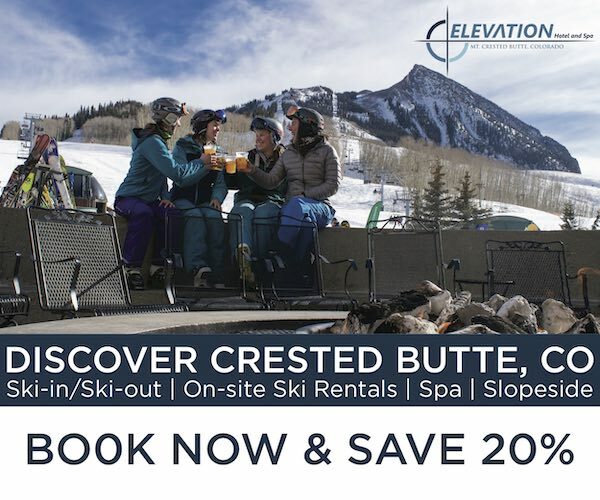 And considering how light these other boots are and how well they ski, a boot with the same performance and 10-30% weight savings is an impressive goal. So how did Scarpa reduce the weight, and what else should you know about the Alien RS? 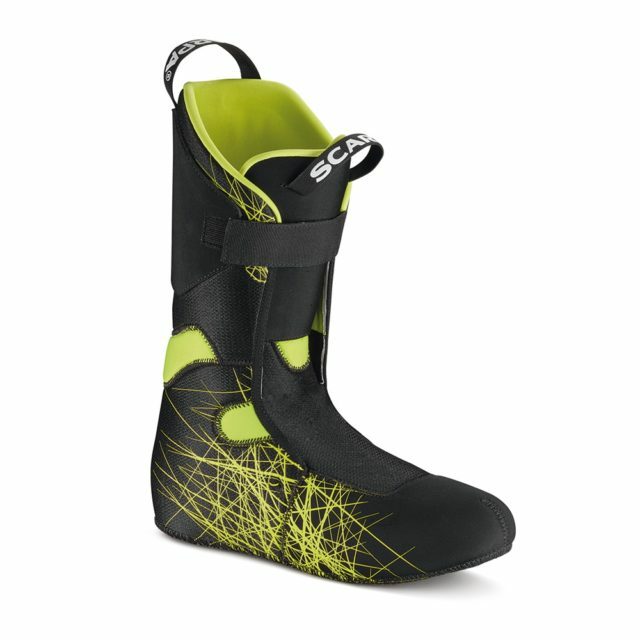 The Alien RS is the first boot I’ve ever skied that has nothing that resembles a buckle or powerstrap. The “New Speed Lock” on the Alien RS is essentially a continuous piece of high-strength, low-stretch Dyneema cord that is looped around the upper cuff and through the walk mode lever. Adjustments in tension/cuff tightness can be made by increasing or decreasing the cord length through the cam lock on the lateral side of the cuff. Scarpa Alien RS — Walk Mode & "Speed Lock Cam System"
The lower shell is secured through a Boa system similar to the F1 Evo or Fischer Travers Carbon. The shell portion of the boot is also more minimal than on other boots we’ve tested. The upper cuff is impressively thick and tall for a boot in this class, but has large cutouts fore and aft for increased range of motion. The lower shell seems to involve quite a bit less material than comparable boots with very minimal plastic extending over the top of the foot/instep and instead employing a stretchy gaiter that incorporates the boa system and comes up above ankle height. In comparison to other boots in this class, the actual plastic shell of the Alien RS extends much less up and over the top of the instep. 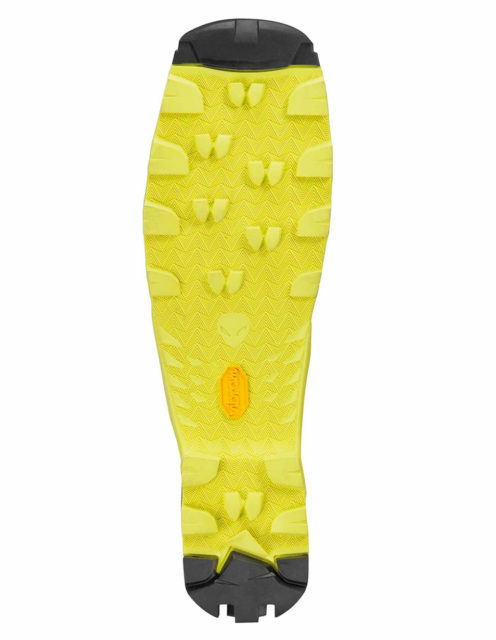 The sole of the Alien RS looks thin, but it’s not as minimalist as the Salomon X-Alp S-Lab. It features sticky-feeling Vibram rubber and has areas of higher density rubber at the heel and toe for added durability. And Scarpa says the toe rubber is thinner to reduce weight and maximize sensitivity while climbing. 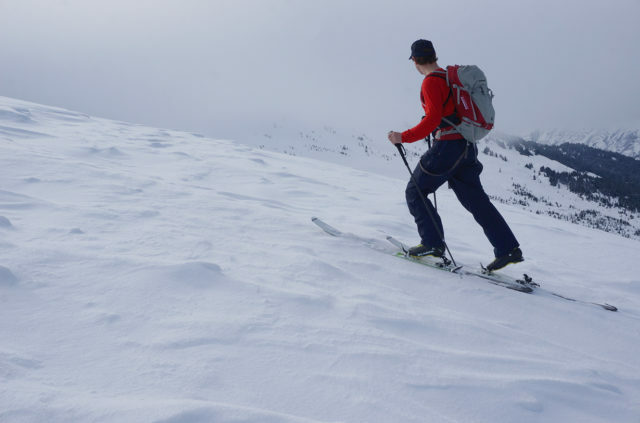 Of the other boots we’ve reviewed in this class, several have no forward lean adjustment (e.g., Arcteryx Procline and Salomon S-Lab X-Alp) while others have 2 settings (e.g., Atomic Backland and Dynafit TLT7). With four different forward lean positions, the Alien RS might be appealing for those who haven’t found the position they like in existing boots. Like all of Scarpa’s touring boots, the Alien RS features a custom Intuition liner designed specifically for this particular model. We’ve had some issues with liners on many boots in this class, and have found some of them almost unusable (I’m looking at you, Dynafit TLT7). Upon initial look and feel, the liner of the Alien RS appears to be the best liner we’ve seen in this class of boot, with enough thickness for support and comfort, while at the same time remaining simple, light, and low profile. 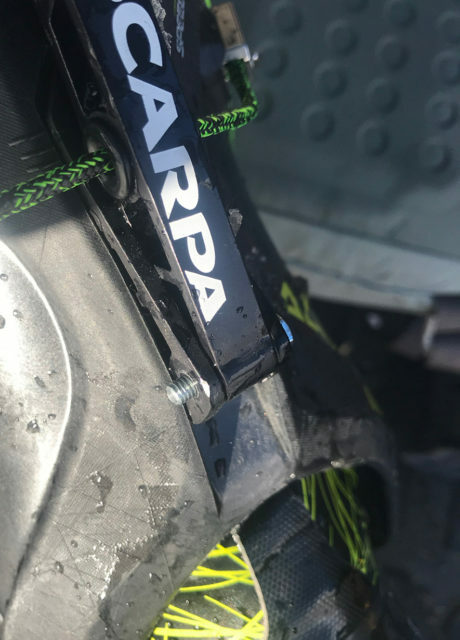 Scarpa continues to build its touring boots with Dynafit’s Quick Step-in fittings, and we remain big fans of this option. 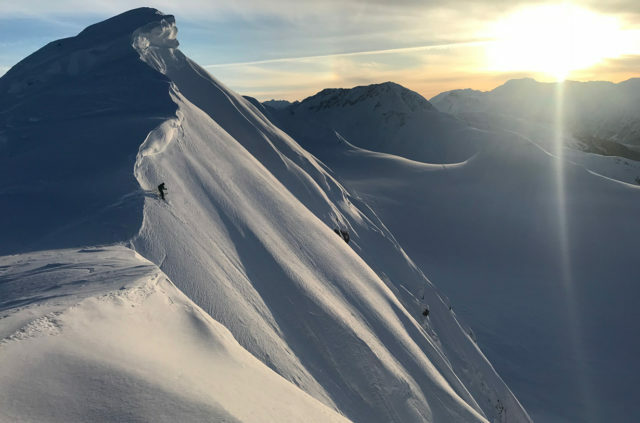 Not only are the fittings Dynafit-certified for standardized dimensions, but they are easier to click into for all forms of tech bindings that we’ve used. 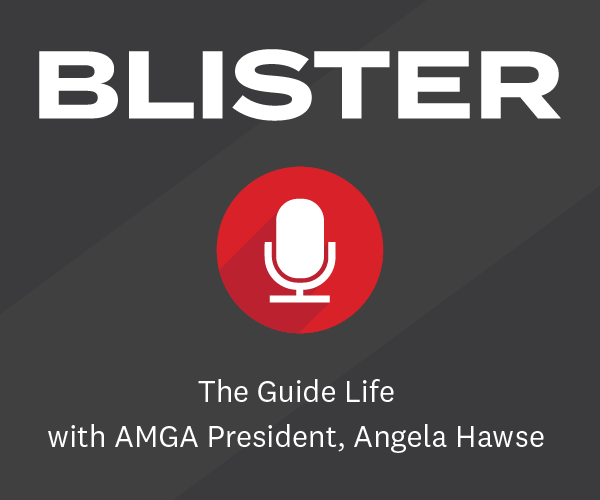 As we say all the time, fit is critical for boots and it should supercede any minor performance difference between comparable boots. Don’t fall in love with a boot based on its specs or looks; buy the boot that best fits your particular foot. One thing that should also be said about Scarpa boots is that the shell size break is different than most (all?) other boot makers. For example, 27.5 & 28 are the same shell size in a Scarpa, whereas 28 & 28.5 are the same shell size in other companies boots. I’ve generally bumped up to the 28/28.5 in most of the light touring boots I’ve tested, despite being a consistent 27.5 in pretty much every alpine boot and mid-weight touring boot I’ve ever skied. With the Alien RS, I was able to stick with the 27.5/28 shell without modification. That said, the Alien is a pretty low-volume fit compared to other Scarpa boots I’ve used, including the new 17/18 Scarpa Maestrale RS, and the version of the Scarpa F1 Evo I had for testing. The good part about this (at least for me) is that the heel and ankle have the best feel and retention for my relatively low-volume ankle of any Scarpa boot I’ve used. Again, this may be in part due to the liner and the BOA, but my heel stays put better in the Alien RS than it does in the Maestrale RS (which also has an excellent Intuition liner). The less fortunate side of the Alien RS fit (for some) is that the toe box is a little more cramped than the other Scarpa boots mentioned above. 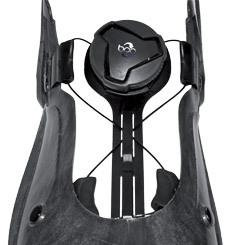 That said, I am happily skiing the Alien RS without any shell modifications, but needed substantial work at the toe box in other touring boots (like the Salomon MTN Lab) and many alpine boots. The aspect of the Alien RS fit that pleased me most was the very adaptable instep height. Because there’s no plastic shell over the instep, instep pressure and height are dictated entirely by the moldable liner and highly adjustable Boa system. I have a high instep, and found the Alien RS to be supremely comfortable in this regard, whereas I’ve had issues with my instep in the vast majority of all alpine and touring boots I’ve used. Scarpa’s site currently states that the Alien RS is compatible with skis with a max width underfoot of 85 mm and a max ski + binding weight of 1300 grams. This seemed a bit unusual, so we reached out to Scarpa for clarification, and they told us that these recommendations are meant to “help customers pick the appropriate ski / binding systems for the specific boots they are using and to help reduce incompatible systems, boot and ski breakage, and warranty issues.” Scarpa said that using a ski / binding system outside the recommended parameters does not automatically void the warranty (they address every warranty claim on a case-by-case basis that takes into account many factors, including, but not limited to, what skis and bindings were used). The Scarpa Alien RS is an intriguing boot, and if it skis and tours as well as the other boots we’ve reviewed in this class, it could represent a nice step forward in the weight-to-performance ratio in this category of lightweight touring boots. I’ve now spent a good chunk of time touring in the Scarpa Alien RS around southcentral Alaska, and so far, I’m very impressed. In our 18/19 Winter Buyer’s Guide, we said the Alien RS almost created a new class of boot due to how well it performs for how light it is. Now it’s time to go into more detail on the Alien RS, and to discuss how it compares to several other lightweight touring boots, including the Dynafit TLT7, Salomon S/Lab X-Alp, Arc’teryx Procline Carbon, and Atomic Backland Carbon. The Scarpa Alien RS is the best boot I’ve ever used for skinning. It has an almost frictionless cuff pivot, and I’ve never felt a need for any more range of motion (“ROM”), even in the most contorted maneuvers while negotiating steep, icy switchbacks, long, flat approaches, or casual pow-skiing laps. Similarly, when hiking or climbing (with or without crampons), the Alien RS is as close to a mountaineering boot as I’ve ever worn. I’ll comment more on this below in the Comparisons section, but for my feet / ankles, the Alien RS is even better than the Arc’teryx Procline in this regard. Even when down-climbing (my least favorite activity while ski touring), the Alien RS feels secure and comfortable. I think the reasons for the Alien RS’s exceptional touring / climbing performance come down to a few factors. First, the liner is excellent. Of all the lightweight touring boots I’ve used, the Alien RS’s liner is the best. It offers an ideal blend of padding and support, while being just thin and flexible enough to allow unobstructed motion and a precise-feeling fit. Second, the Alien RS’s BOA system and the shape of its lower shell work very well for a boot in this class, especially when combined with the Alien RS’s flexible liner and large ROM. For most boots in this class, lower-shell fixation / tightening is accomplished by a single instep buckle. This is simple and reliable but, for me anyway, the instep buckle often needs to be flipped open or at least loosened to a different notch for long skintracks to avoid the feeling of having a pressure point over my instep. But with the Alien RS, I’m able to tighten down the BOA at the beginning of the day to a snug, evenly distributed amount of tension around my foot. At the top of the run I sometimes tighten the BOA closure a bit more, but I usually don’t even think of it because it’s already plenty secure. I don’t think I’ve ever been able to do that on the other two-buckle touring boots I’ve used. Despite being a fairly big guy (6’, 190 lbs) with an affinity for big, long powder skis and high speeds, I’ve been a regular user of lightweight two-buckle touring boots since the release of the Dynafit TLT5 Performance. Since then, I’ve skied just about every boot in that class (with the notable exception being the Fischer Travers). I’ve also done my share of modifying and tweaking on these boots in order to eke out extra ski performance, because that’s always been where my priority lies. So, how does the Alien RS stack up? Overall, the downhill performance of the Alien RS is definitely in the same category as the Dynafit TLT7 Performance, Salomon S/Lab X-Alp, Arc’teryx Procline Carbon, Atomic Backland Carbon, and Scarpa F1. But the Alien RS is slightly softer than all of them in every direction of flex (e.g., forward, rearward, and lateral). But “slightly” is the key word here, and the Alien RS still fits right into this category. For example, I’d say that the forward flex of the Alien RS is almost exactly the same as the Arcteryx Procline Carbon, which is otherwise the softest boot in that group from my experience. So the bottom line here is that all of these boots are very similar in terms of the stiffness of their flex patterns. What makes the Alien RS particularly interesting is that it provides that performance at a significantly lower weight than most of its competitors. The flex pattern of all the boots in this class tends to be pretty linear initially, followed by a quick ramp-up. The Alien RS is no different. Technically competent and well-balanced skiers will be able to drive a variety of skis (including >110mm powder boards) in all conditions with the Alien RS. But, like all boots in this category, the Alien RS is not going to provide the control and power to ski super fast in any kind of chunder or variable snow, especially with bigger skis. That’s simply a compromise that currently needs to be made with boots this light. 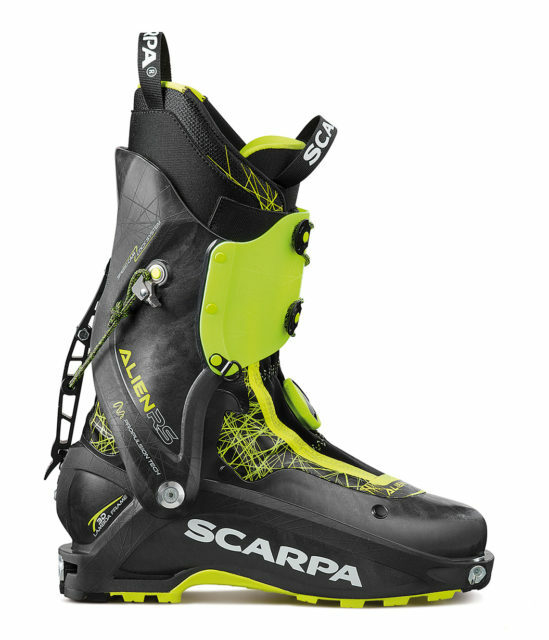 On that note, on Scarpa’s website, they say the Alien RS should be used with skis that are “max 85mm width, max weight ski + binding 1250/1300 gr.” We talked to Scarpa and confirmed that this is their recommendation, but using a heavier or wider setup will not necessarily void the warranty. Which is good, because I think this boot works well with setups outside of that width and weight range. For most of my testing I mated the Alien RS with the 185 cm Black Diamond Helio 105 and Dynafit Superlight 12 bindings, which is just about the lightest and narrowest setup that I spend a lot of time on. I had no trouble driving those skis in a variety of conditions while wearing the Alien RS. I did have to slow down significantly when conditions got firm or bumpy. 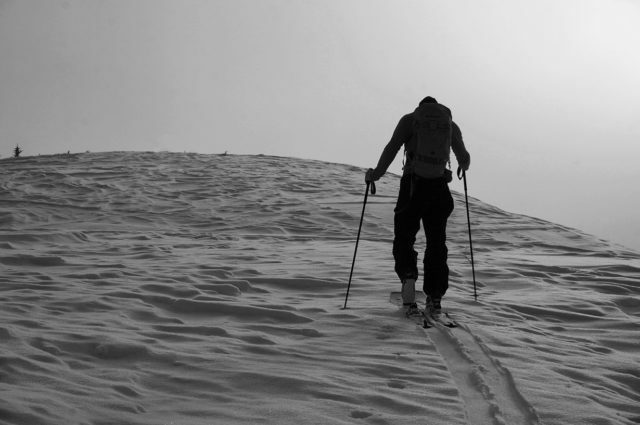 But in smooth pow or corn, I could lay down fast, controlled turns without difficulty. It’s worth reiterating that, like all boots in this category, the Alien RS will not be as forgiving and / or supportive as beefier, heavier touring boots (e.g., Scarpa Maestrale, Tecnica Zero G Tour Pro) if you tend to get way back or far forward on your skis a lot. That said, I’m certainly not the most proficient freestyler (closer to the least proficient! ), and I still managed to ski away from a few 360’s on my Alien RS / Helio combo — and not always in soft snow. The Alien RS is a very light boot with a fairly thin plastic shell (similar to all the other boots in this category) and thin rubber soles. I haven’t used them a lot in rocky terrain but I can only imagine that they will wear out on sharp rocks faster than thicker-soled, heavier boots like a Maestrale. The only issue I had with my pair was the loosening and loss of one of the lock washer / bolts that hold the walk mode together. It was only on one boot and was easily replaced at my local fastener store, but if you do get the Alien RS, keep an eye on those lock washers, and consider getting a spare for the repair kit. I’ll update this review if I notice any durability concerns down the line. While the stock liner in the Backland Carbon is among the shortest, thinnest, and least-supportive we’ve used, the Backland Carbon’s shell / tongue combo is probably the stiffest of this category. For my foot, the Alien RS tours quite a bit better — even when I don’t consider the “fiddle-factor” of the Backland’s removable tongues. And while it’s not as stiff, the Alien RS still skis down respectably well. Those looking for the stiffest two-buckle boot would probably be happier with the Backland Carbon, but only after buying new liners and a powerstrap (see this review for more on potential modifications). But for an all-round, big-day, long-traverse, lightweight touring boot, I think the Alien RS is the better call. The fit of the Atomic is also quite a bit lower-volume than the Alien RS. I personally would probably size up to 28.5 on the Backland Carbon, while sticking with my usual size of 27.5 in the Alien RS. The only boot liner I’ve used that’s worse than the Backland Carbon’s is that of the TLT7 Performance. But, like the Backland Carbon, the TLT7 Performance’s shell is among the stiffest here, and that’s without having to use a removable tongue. The TLT7 has a much higher-volume fit overall compared to the Alien RS, but the lower-shell length of the TLT7 felt a tad shorter on my foot in the same size. Both the TLT7 and Alien RS tour exceptionally well, but I prefer the security of the Alien RS’s BOA system and its simple walk mode, despite the stiffer flex of the TLT7 Performance. The built-in lateral flex in the upper cuff of the X-Alp (while in walk mode) is a cool feature that makes it very comfortable for climbing and walking. As a result, the X-Alp and Arc’teryx Procline (which shares the same walk mode) are the boots here that come closest to beating the Alien RS in terms of overall uphill performance and walking around in the mountains without skis on. For me, however, the extra security of the Alien RS’s snug, comfortable BOA system and increased ROM makes it superior. 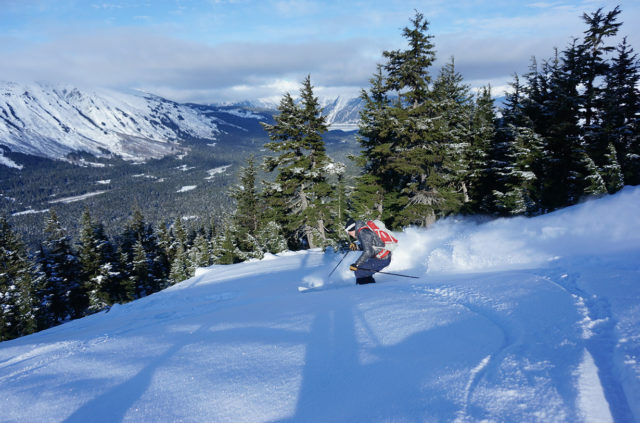 The Salomon might ski a touch stiffer, but the overall flex is very similar. Basically, everything I wrote about the S/Lab X-Alp applies here. The Procline Carbon Support is also heavier than the X-Alp and much heavier than the Alien RS. It’s hard for me to imagine too many people having this as their only boot, unless you only ski in the backcountry and don’t ever need/want a legitimately stiff touring boot. None of the boots mentioned above, including the Alien RS, will match the downhill performance of heavier boots like the Atomic Hawx Ultra XTD 130 or 120, Scarpa Maestrale, etc. So, I think the Alien RS is a boot that will likely be most appreciated by those who have at least one pair of beefier boots, and who are looking to add a lighter boot for longer days in the backcountry. That said, anyone looking for a very light boot that tours as well as or better than any boot on the market, and that can still drive a fairly big backcountry ski at fairly high speeds should put the Alien RS high on their list. The Scarpa Alien RS is a remarkable touring boot, and I think it’s a small step forward in the overall evolution of lightweight touring boots. It has an excellent touring mode, reliable ski mode, and the best liner of the lightweight touring boots I’ve used. In my perfect world, I’d own a 3-boot quiver that would include a full-on alpine boot, a burly touring boot in the 1300-1600 gram range, and the Alien RS. Excellent review, thanks! I’m getting to know mine more this week. So far so great. How do they compare to the Fischer Traverse? I would think that’s the main competitor, no? Interesting that things can be perceived so differently by different people. I’m skiing the Alien RS now, all of last season in the X-Alp. To me the walkmode in the X-Alp is far superior when it comes to lack of friction and range. The beefier liner in the RS is really noticeable in that it ads bulk and friction making it walk less efficiently. Still good, great even, but not as good as the X-Alp. As for the downhill, to me the RS is MUCH stiffer than the X-Alp but the flex is significant less progressive. Adding a booster strap really takes it from feeling like a stiff, light boot that has a very springy “carbon fibery” flex and gives it a way more linear feel and also adds the feeling of height in the cuff, giving more support. Hey Simon, Are you X-Alp’s the carbon S-Lab version or the non-carbon ones? I have skied both and the S-Lab carbon version is a lot stiffer than non-carbon X-Alp. The F1 has a beefier feel overall and skis big skis a little bit better but the difference is very small. The overall forward flex isn’t dramatically different. If price wasn’t an issue I’d go Alien RS but the F1 is a great boot and I doubt you’ll regret having them if it’s a way better deal. may I ask you please how long is your foot exactly in mm? My one is 275mm precisely. I purchased Scarpa Alien RS. First I bought size 28 – too short. There is really performance fit at my right foot. The pressure on thumb / toes is not appropriate for walk i suppose. I returned it and changed to the size 29 . 29 size is contrariwise too loose. 1. Interesting that you found the heel hold decent. It seemed pretty loose to me when I tried them on in the shop, and others have confirmed my complaint. Guess it just goes to show that everyone’s anatomy is different. 2. There was some discussion about this on TGR, but it might be worth mentioning that the carbon-infused lower can be tricky to punch. I really wanted these to fit, but my foot is just too fat to experiment with a plastic that won’t move much. 3. It seems crazy to me that your measured weight was ~100g heavier than stated. When you’re getting into boots this light, that seems rather significant. A <900g boot is much different than a ~1kg boot. My 26.5/27 is 920g for liner and shell. Right boot punched twice with great success. Awesome boots overall! When it’s hard snow i wouldn’t ski anything more than my 177 mtn explore 95 but in pow my 105 or 120 waist 1600g touring skis probably works fine! But I do realise the limits of a boot like this and ski them accordingly.